We all work or have worked. We’ve had jobs we love and jobs we disliked. 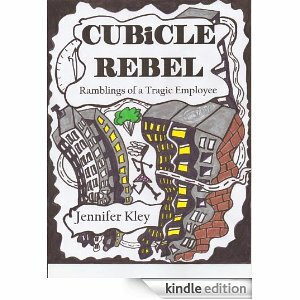 This blog (& book) is about my journey through jobs. If the journey was rosey I wouldn’t have felt a need to write a book. I mean, how far would “I loved working at ABC Co. #1, #2, #3, etc.” make for reading? Oh, there were ridiculous mistakes made, mass confusion and hideous detours by yours truly as I navigated my way through vocational life vs. my “real” dreams. I delivered papers (The Washington Star) at 11 years old. I worked at a nursing home in–of all places–the laundry department. At around 14 years old. It was required that I obtain Jordache jeans, not to mention free desserts make me subservient. I babysat kids. Random kids. Babies that wouldn’t stop crying. Spoiled brats with too many toys. And gosh, this was before Nickolodeon and the Cartoon Network. Babysitters pre-cable-in-every-home should’ve been compensated with stock options. I temped. I’ve stuffed more envelopes than there are envelopes. I’ve answered phones as the perky desk mannequin girl even when I was feeling ornery and hormonal. I should have an Emmy by now. The Perky Receptionist Emmy Award. I’ve spooned out food in cafeteria settings. I’ve cleaned up spills, pizza crusts with teeth bites in them. I’ve cleaned bathrooms…random body fluids of total strangers. There were brown smears involved. I’ve filed endless documents while wearing high heels, stooped over waiting for the end of the world. I’ve smiled like Cheshire the Cat, all fake and stoic and necessarily. I’ve fetched lunch (and subsequently cleaned up after) grown men. Really grown men. Like, 55 years old. Men who made six times more than me. There were baked beans involved once. And I’ve never been homicidal. I’ve organized and filed prescription drug bags bearing the names of total strangers with cancer, depression, etc. I’ve made and sold art. Let me tell you…it wasn’t easy. I’ve counted chicken parts. Some with hair still on them sticking out right through the flour batter coating. I’ve filled out a lot of applications and waited by the telephone wondering if I would be able to pay my electric bill on time on any given month. One thing I know is true: Gross pay is misleading. It messes with your head. You only think you’re making, say $30,000 when in actuality it’s only $24K after taxes.